We had 14 Olympic medals in our office in Rio Sunday evening. That’s 14 more than we usually have. They were brought by our guests: Michael Phelps (six), Katie Ledecky (five) and Simone Biles (three, though she has since added another). We gathered them together for this week’s cover photo, shot by Simon Bruty. 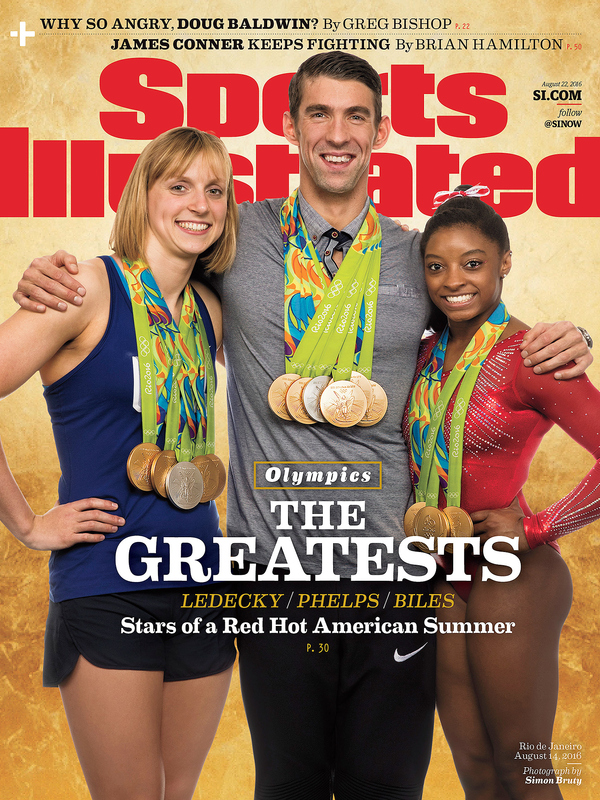 This is the 11th SI cover for Phelps and not the first he has shared with Biles and Ledecky. He made his SI cover debut before the Athens Games in 2004. The photo session took place at 7:45 p.m. in Rio. Ledecky—with her mother, Mary Gen, her father, David, and her brother, Michael―hung out in our office while Phelps did various TV interviews and held his final press conference of the Games (and of his life, presumably). Biles arrived fresh from winning gold in the vault at nearby Olympic Park. Katie Ledecky, Michael Phelps and Simone Biles during their SI cover shoot. There was an easy rapport between the three Olympians―it must be what it’s like at the commissary on Valhalla. Ledecky and Phelps have crossed paths at swimming holes around the world, and it’s not the first time Biles and Phelps have met up. The three certainly have one thing in common: metallurgy, though Phelps clearly holds a master’s degree. He helped arrange the medals around the necks of both Biles and Ledecky, artfully dovetailing the discs and smoothing the ribbons. It looked as if he had done this before. All three athletes are profiled in this week’s issue. S.L. Price follows up his profile of Ledecky from May 24 with a piece about her accomplishments in Rio; Tim Layden expands on his profile of Phelps from November 2015 and looks at the closing chapter of Phelps’s swimming career; and Brian Cazeneuve, who wrote a feature about Biles in 2014, takes stock of the transcendent gymnast’s Olympic performance.